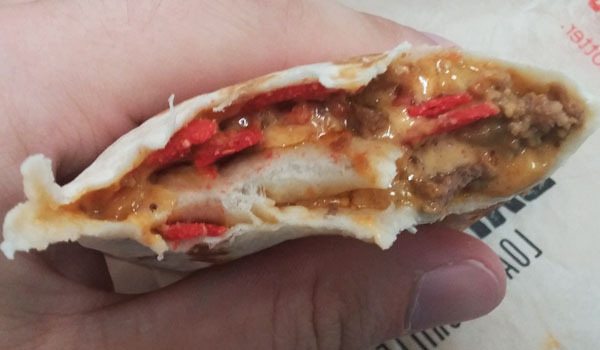 Last week, Taco Bell debuted three new menu items: The Dare Devil Loaded Grillers. Each of these loaded grillers has similar ingredients, but is diversified by the sauce that gives them their name. The three include Chipotle, Habanero, and Fiery Ghost Pepper. 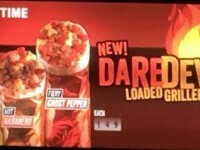 Right now they are available for just $1 (however, that is most likely a limited time deal, and if they stick around, the price will be similar to the other loaded grillers, which is around $1.59). Each of these grillers has similar ingredients; Similar to the Beefy Nacho Griller, just with a different spice. 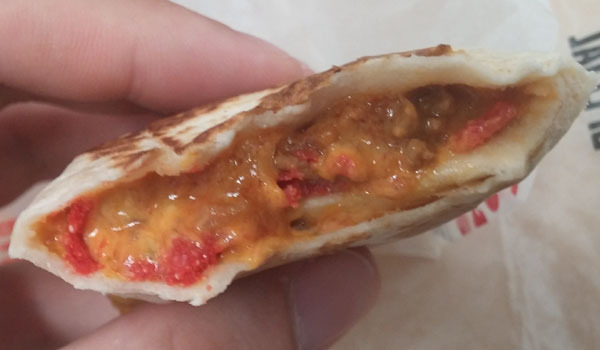 The similar ingredients include seasoned beef, nacho cheese, and the small red tortilla chips. The seasoned beef is always great (Taco Bell uses it in almost every product they make), and the nacho cheese is a great complement to the beef. The red tortilla chip pieces keep the grillers crunchy, but make sure to eat the griller quickly, because these have a terrible habit of getting soft and mushy over a short amount of time. I’ll review each of these in the order I ate them; That is to say, the mildest to the hottest. Anyone who regularly reads my reviews knows that I am a huge fan of the Chipotle sauce at Taco Bell, and will order it on anything I can get my mouth on. The Chipotle sauce is very slightly spicy, but has more of a creamy flavor. I’m not sure if the Chipotle sauce used in my griller was different than the regular Chipotle sauce on other items, but it did taste spicier, especially as I got to the later portion of the loaded griller. 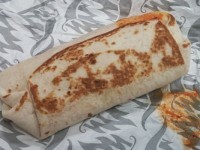 The sauce to nacho cheese ratio was perfect, and I will likely be ordering the Chipotle loaded griller for a long time (at least until the price goes up). The mild heat was perfect for me, because the flavors of the beef and cheese could be tasted. The Hot Habanero sauce was also creamy like the Chipotle, but had a tangy flavor. It was the most “sour” flavor of the three. 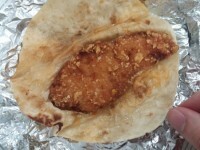 It was a little less spicy than Taco Bell’s old lava sauce, but was similar in style. The Habanero sauce was definitely hotter than the chipotle, but there is a delayed heat that works its way on the back of the throat that lingers for a moment (while the Chipotle heat didn’t have much staying power. The flavor of the Habanero did slightly overpower the rest of the items in the loaded griller, but not to an unenjoyable experience. I ate the Fiery Ghost Pepper griller quickly, ad like the Habanero, the impact wasn’t immediate, but when it came, it was very powerful. The sauce was more standard in flavor (not tangy like the Habanero, but more like the Chipotle). 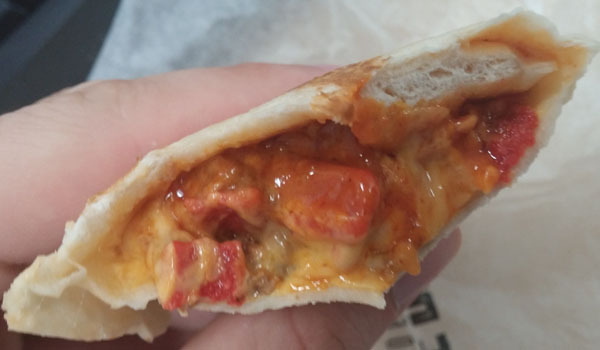 At the halfway mark of eating the griller, my tongue and throat lost most of their feeling, and the other ingredients of the griller were gone, replaced with familiar textures and an overpowering, eye-watering experience. The spice wasn’t terribly overpowering, but the feeling in the throat lingered for 10-15 minutes until I was able to drink some water. I would probably describe myself as more of a lightweight on the heat tolerance scale, and the Fiery Ghost Pepper griller was spicier than I would normally enjoy. Overall, I enjoyed the Chipotle most of all, as the flavor and spice levels were right in with what I’m comfortable with. If spicy is your thing, then the others are sure to satisfy you. For the price of $1, the price is right in line with what I’m willing to pay for a loaded griller (compared to similar dollar menu items.